Here are a couple of new cards that I made with the new Thinlit Card Dies. These new dies are fantastic! The dies make a flip card a quick piece of work! I made my cards with the Winter Frost designer paper in the Holiday Mini catalog. The first stamp set is the Jewish Celebrations set that is still available from last year’s Holiday catalog. I love the colors of blue in this designer paper. The card base is Island Indigo with an accent of silver glitter paper cut with the Labels collection framelits. The images are stamped with island indigo ink. The inside of the card is layered with more Winter Frost designer paper and a piece of coastal cabana card stock. 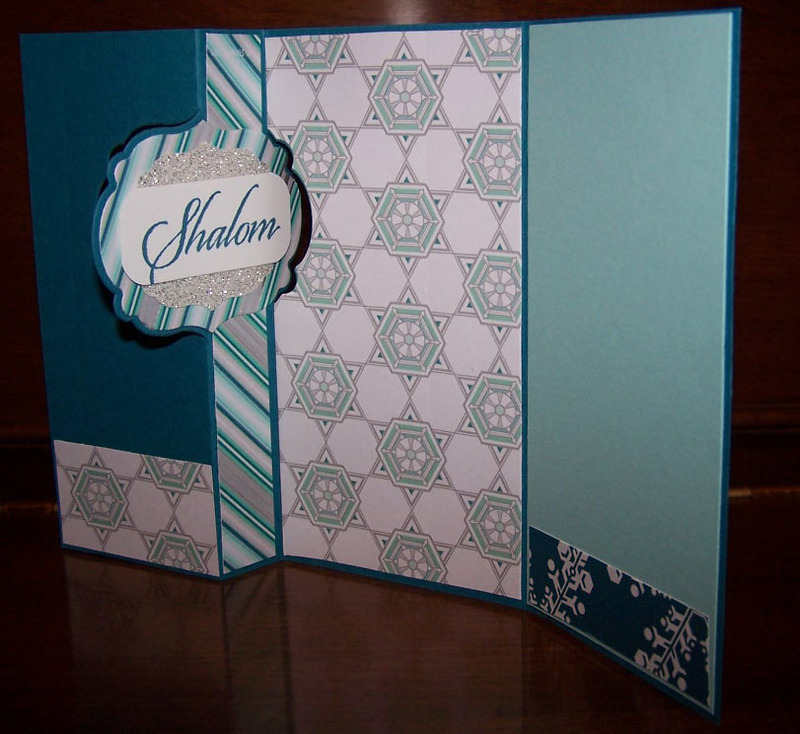 The message shalom is stamped and added to the inside of the flip portion of the card. The second card uses the same format with the thinlit die to make the flip card with the same designer paper. But the stamps are Christmas ornaments from the Christmas Collectables set. 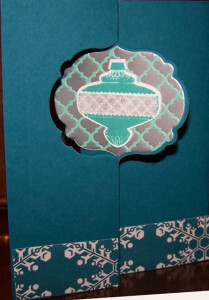 I love the Winter Frost designer paper with the two sheets of metallic patterned paper. 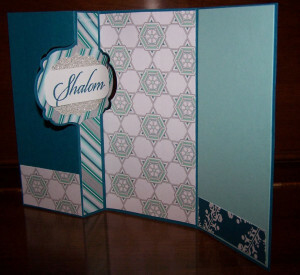 The Shalom card uses the striped metallic designer paper on the background and going down the fold on the inside of the card. 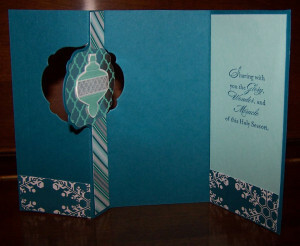 The Christmas card uses the metallic designer paper with the mosaic pattern on the flip portion of the card. So which metallic paper do you like better? Let me know your vote – the metallic strip or the metallic with the mosaic pattern! 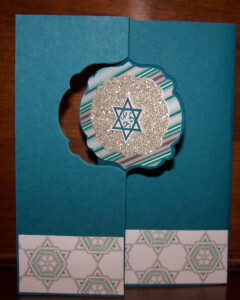 Christmas cards, handmade cards, Hanukkah, Thinlit Card Dies. Bookmark.